January 1st was Public Domain Day, when copyrights expire and creative works enter the public domain in the US. 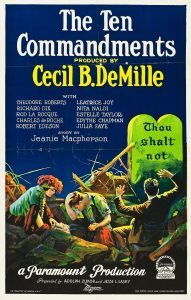 A few notable works that entered the US public domain this year include “Stopping by Woods on a Snowy Evening” by Robert Frost and The Ten Commandments by Cecil B. DeMille (1926 version). In addition to works with expired copyright, public domain also refers to works that are so old as to have been created before copyright laws or those works for which the author has declared them to be in the public domain immediately. Although there are exceptions, in Canada published works enter the public domain 50 years after the death of the author. At that point permissions are no longer required for reproduction or distribution. In the US, the current term is 70 years after the death of the author, but public domain laws are country-specific. A work that is in the public domain in Canada may not be in the public domain in the US, and vice-versa. Another exception is when a work has new material added. For example, although the copyright in Shakespeare’s plays expired long ago, many of the published editions of his plays contain added original materials (such as footnotes, prefaces etc.) which are copyright protected because the authors have used skill and judgment in creating the new material. This creates a new copyright in the added original material, but not in the underlying text of the original work in which the copyright had expired. You can’t assume everything you find on the internet is in the public domain just because it is publicly available. Most of the material you find online is protected by copyright; however, you may be able to use it for educational purposes according to the fair dealing provisions in the Copyright Act or under the exception for educational use of material publicly available through the Internet (Section 30.04(1) of the Copyright Act). A common misconception is that works in the public domain do not require citations or attribution. Rules governing plagiarism and academic integrity still apply to works in the public domain. Currently, trade negotiations with the US indicate the term for creative works entering the public domain in Canada will soon be extended to 70 years, to align with the US public domain term. If this happens, numerous works could be removed from the Canadian public domain, creating a myriad of issues for creators, artists, audiences, and organizations using, cataloguing, and benefitting from these works. For more information on determining if material is in the public domain, consult this University of Alberta Public Domain Flowchart or the detailed section of the Dalhousie Copyright Office website. This is part two in a four-part series of blog posts recognizing Fair Dealing Week 2018 (February 26–March 2, 2018). 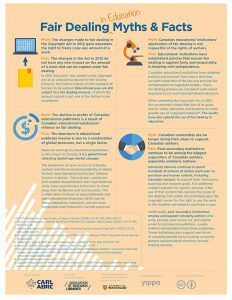 This infographic provides some of the context and history for fair dealing, and clarifies some common misconceptions. It also shows how fair dealing functions in academic environments like Dalhousie University. This is part one in a four-part series of blog posts celebrating Fair Dealing Week 2018 (February 26–March 2, 2018). Fair Dealing Week (Fair Use Week in the United States) is the Association of Research Libraries (ARL)’s annual recognition of fair dealing. This year, we recognize Fair Dealing Week with four blog posts on the topic of fair dealing and some Copyright Office drop-in hours on Tues., Feb. 27. These posts will outline why fair dealing is important, what fair dealing means to instructors, and how fair dealing applies to students. Step Two: If your use does fall under one of those purposes, you can then proceed to applying each of the six factors the Court identified. These six factors are: Purpose (different from the purpose in the first step), Character, Amount, Alternatives, Nature, and Effect. If your use of a copyrighted work passes both of these steps, it can be deemed fair dealing. 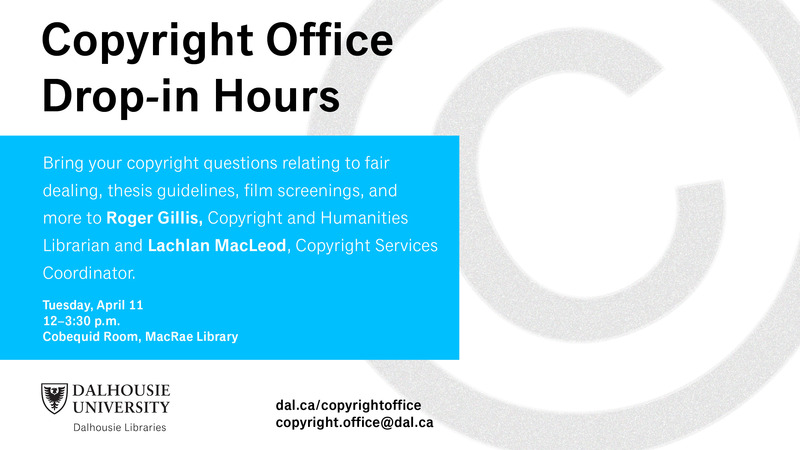 To clarify the determination of fair dealing, Dalhousie has developed a set of Fair Dealing Guidelines, in cooperation with the Association of Universities and Colleges of Canada. These guidelines apply to all members of the Dalhousie University community – faculty, staff and students.